Paulist Fr. 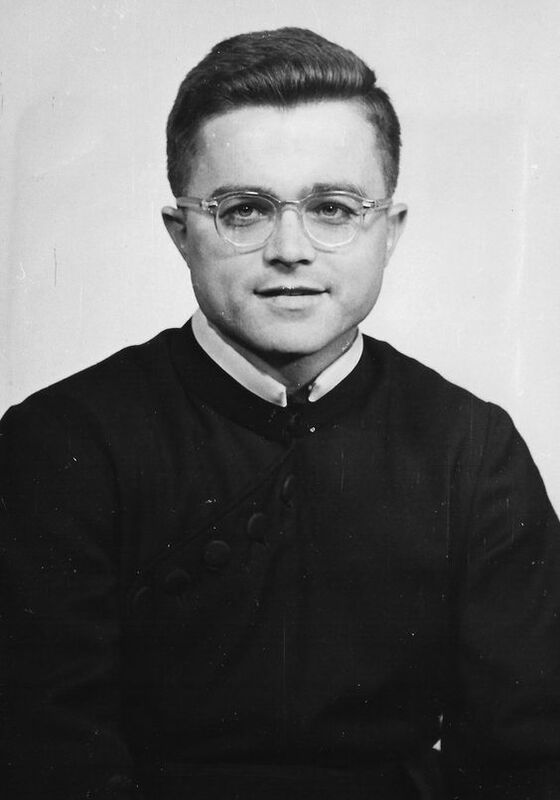 Vinny McKiernan was ordained a priest on May 11, 1957. 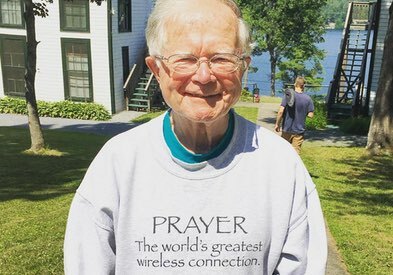 In 2017, he celebrates the 60th anniversary of his ordination. COLUMBUS, OH — Paulist Fr. Vinny McKiernan uses a play on words to guide a lunchtime prayer group to think more deeply about Easter. This twisting of language has become one of the distinguishing features of Fr. Vinny’s 60 years as a priest. Fr. Vinny leads this group from quiet meditation in an indoor chapel to an outdoor courtyard. He encourages the little flock to consider the interplay of the words “belief” and “be leaf” and to gaze at the trees and flowers in full bloom. Then, he gathers the group in a circle and urges everyone to make loving eye contact toward every other person in the group and to repeat one another’s name. Encouraging this direct acknowledgment among the group is in keeping with his model of a shepherding and personal relationship among the flock, and with the divine. “That idea of the good shepherd that I know mine and mine know me,” he says. This micro-retreat contrasts with the traffic alongside the courtyard on Lane Avenue, the main drag through Ohio State University in Columbus. And it’s emblematic of what Fr. Vinny tries to live as a Paulist Father — shepherding people toward spiritual reflection in the midst of busy days. “It’s a way of helping their relationship immediately with God,” he says of the centering prayer he practices with these older adults and OSU students. He’s the only teacher of the official “Introduction to Centering Prayer” workshop in his region. It’s a workshop he’s taught over 100 times. The centering prayer group is just a small part of Fr. Vinny’s flock at the Newman Center on the campus, where he’s worked for 26 years. Over the course of his life and work, he’s been a novice director with the Paulist Fathers. He’s also become known for spiritual direction, and giving retreats to nuns. But he says the emphasis of his life has been what he describes as the “core” of being a priest: celebrating the sacraments in daily Mass, Sunday mass, weddings, baptisms and funerals. He says his understanding of the work of a priest was shaped by the name of the parish in which he grew up in New York City — Good Shepherd. Good Shepherd Church in the Inwood neighborhood of northern Manhattan was then an Irish-Catholic enclave where the kids made off-color jokes, Fr. Vinny remembers. While he dropped the violence of those jokes, the jovial quality never left him. He says his Paulist seminarian education in Greek and Latin only gave him more material, more ways to twist and bend language. “Altar behavior may require us to alter behavior, especially after an altercation,” reads one entry from the @Vinamin Twitter page. Fr. Vinny says the same about his own life, being utterly satisfied with ordinary life and whatever comes along.